Lock in a great price for Pousada Porto Imperial – rated 9.1 by recent guests! Great location. Very good breakfast. Nice clean rooms! Especially liked the outside shower in the Superior room. Staff was very helpful and friendly. Especially Charles. He helped us daily to organize our excursions with great recommendations. Excellent pool and bar. Lobby lounge and breakfast area are spacious and well decorated. Shower was awesome. The sauna was great. Short walk to all restaurants and stores. Beautiful setting. Staff spoke perfect English. Overall design is great ! There are nice communal areas with few lounge rooms and very nice pool . Location is great for exploring historical part of the town . Many restaurants and shops just few steps away . Our room was at a ground floor and we had outdoor shower . The hotel is lovely, the staff friendly and helpful - especially Charles; breakfast was great with lots of healthy options and the location was excellent - very central. In our 6 week trip around South America this has been one of the best hotels we have stayed at. From the time we arrived we felt very looked after...the staff spoke English very well and helped us with anything that we needed. Our room was perfect...having all the facilities expected and the bathroom is amazing with two showers (one open and one under cover)! The pool area is definitely the highlight of the hotel...with a little jacuzzi in it...it is the perfect place to relax with a cocktail. There is a bar and couches in the pool area as well. The hotel is very clean and the decor is done so well. If we ever in Paraty again we will definitely be staying here! Highly recommend this hotel. One of our top picks in Paraty.Located in Paraty historic center, Pousada Porto Imperial offers free WiFi, an outdoor swimming pool and a sauna. Praia do Pontal Beach is a 10-minute walk away and restaurants and cafes are nearby. All rooms at Porto Imperial are equipped with free Wi-Fi access and air conditioning. They are tastefully decorated with timber furnishings and contain a HD LCD TV, a mini-bar and a private bathroom. The daily breakfast buffet offers a variety of fresh fruits, breads and cold meats. Guests can also enjoy regional specialties, as well as a selection of drinks in the restaurant. The guest house offers 24-hour front desk service, energy generator and laundry facilities. When would you like to stay at Pousada Porto Imperial? Please note that all guests must insert personal number ID upon booking. Equipped with free Wi-Fi access and air conditioning, this room provides a 32-inch LCD TV, a mini-bar and a private bathroom with a hairdryer. Parking is free. 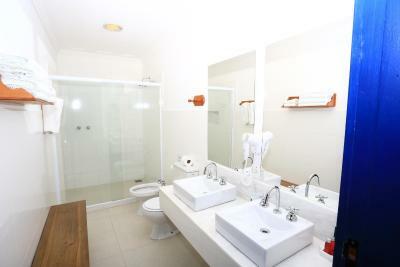 Equipped with free Wi-Fi access and air conditioning, this room provides a HD LCD TV, a minibar and a private bathroom. Parking is free. This tastefully styled, spacious air-conditioned suite offers a private bathroom, an HD LCD TV and a mini-bar. House Rules Pousada Porto Imperial takes special requests – add in the next step! Pousada Porto Imperial accepts these cards and reserves the right to temporarily hold an amount prior to arrival. Installment payments will be charged upon the total amount of the reservation. No view from the room . Breakfast could be better and bed sheets were not so good . But those few small things were not at all changing great impression the hotel left on us . There is only two staff (waiters/barmen) that work at any given time, and they take care of anything you need whether at the pool or in the lounge inside. This meant that sometimes it took a bit of time to find one of them to assist us. But that being said, they were always so helpful and attention even when doing anything for us. So more of an observation than a complaint. Well located across from the main square but because we were visiting during a holiday there was an extremely loud band playing in the square until late in the night, which made it imposssible to sleep. Clean facilities, very friendly professional staff. Porto Imperial was a very nice Pousada to stay at (stayed there with two frienda for one night). The staff were all lovely and extremely helpful and the breakfast was good. The location of the Pousada is right in the historic centre so it is well situated and several restaurants are just a minute(s) away. The room was also nice and was one of the nicer rooms we had in Brazil, however they were not quite as nice as in the pictures. Would definitely recommend! Could hear the outside traffic from my room. They need a lesson in making egg white omelettes. Also, the breakfast attendant smelled like he hadn’t taken a shower in days.